Get 40% in coupon. Buy "Garcinia Cambogia 60 capsules" and get a coupon worth £2.11. Get 20% discount in "Garcinia Cambogia 60 capsules" and save £1.06. Get 40% in coupon. Buy "Garcinia Cambogia 120 capsules" and get a coupon worth £3.52. Get 20% discount in "Garcinia Cambogia 120 capsules" and save £1.76. If you are constantly involved into physical activities and follow a healthy well-balanced diet but still not satisfied with your reflection in the mirror, then probably you should consider a weight loss supplement. Zumub Garcinia Cambogia capsules are likely to be the missing puzzle piece you’ve been searching for. Appetite Suppression. Spending more calories than consuming may only sound easy - those who have tried it know how hard it is to resist a roaring feeling of hunger. Fat Production Decrease. Firstly, it’s worth mentioning how fat is generated in the body. It’s citrate lyase enzyme that triggers its production. Garcinia Cambogia may be able to put down its synthesis. Plus in this product Garcinia Cambogia is coupled with chromium picolinate - well reputed element - and vitamin C, that will act as an antioxidant. That makes Zumub Garcinia Cambogia tablets perfect for those who want to lose weight, stay healthy and be happy, because Garcinina Cambogia increase the production of serotonin, responsible for maintaining good mood. 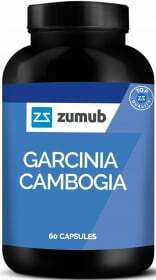 The only way to know if Zumub’s Garcinia Cambogia tablets work for you is to try it. Who knows - you may feel as it was designed just for you. Have a question about Garcinia Cambogia? What is it, what does it do, how and when to use or something else? Ask us. Didn't noticed any side effects. Still to soon to see the results but I am taking it daily. ALLERGEN INFORMATION: May contain allergens handled in the production facilities, such as other cereals containing gluten, milk, lactose, soy or nuts. As a dietary supplement, take 1 capsule 30-60 minutes prior to a meal or as suggested by a medical professional. WARNINGS Garcinia Cambogia : Do not exceed recommended dosage. Keep out of reach of children. The product should not be used in case of hypersensitivity or allergy to any of the ingredients of the formulation. Food supplements should not be used as a substitute for a varied and balanced diet and healthy lifestyle. Store in a cool, dry place. Please Recycle. BEST BEFORE: Please see lot number and expiration date stamped on the packaging.